Balanchine's Symphony in C + more! The Australian Ballet’s Symphony in C. Photo Justin Ridler. The Australian Ballet’s Symphony in C brings together great works from the past century to showcase the vigour of modern ballet. 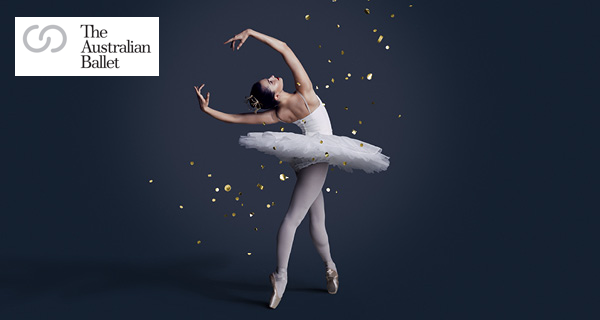 Coming to Melbourne following a rapturously received season in Sydney, Symphony in C pairs a tutu spectacular by pioneering choreographer George Balanchine with a selection of perfectly contained shorter works, including two Melbourne debut works by dancers of The Australian Ballet. Symphony in C plays exclusively at Arts Centre Melbourne, State Theatre from 24 August to 2 September 2017. The ballet that gives this season its name, Symphony in C, is a tribute to the golden era of classical dance. The work runs the gamut of balletic expression, from explosive leaps and quick footwork to a swooning pas de deux with captivating bends and balances. Although Symphony in C is grounded in Balanchine’s classical training in Imperial Russia, shades of his years on Broadway emerge in a culminating display of pure white tutus. The work is set to George Bizet’s eponymous score, written in 1855 when the composer was just 17 years old and living as a student in Paris. Amanda McGuigan in ‘From Silence’. Photo Kate Longley. The elaborate group work of Balanchine is perfectly complemented by a series of shorter works, each with their own unique modern energy. Making their Melbourne mainstage debuts are two new works by corps de ballet dancers Richard House and Alice Topp. After making their names as choreographers in The Australian Ballet’s new work series Bodytorque, House and Topp debuted their first mainstage shows in the Sydney season of Symphony in C in 2016, garnering popular and critical acclaim. House’s From Silence opens with the striking tableau of a dancer in a ruby red dress that flows for metres across the stage. With dreamlike set and costume designs by Kat Chan, this work for four dancers movingly explores youthful love and loss, accompanied by cinematic music by Michael Nyman. House has had three previous works included in The Australian Ballet’s Bodytorque seasons, and his passion for choreography dates back to his years at The Australian Ballet School, where he was awarded the Graeme Murphy Award for Excellence in Contemporary Dance. Kevin Jackson, Vivienne Wong and Rudy Hawkes in ‘Little Atleas’. Photo Daniel Boud. Topp’s Little Atlas sees three dancers in sleek black performing a closely entangled pas de trois, in an exploration of the human ability to recreate and unmake memories. They are accompanied by the soft piano music of Italian composer Ludovico Einaudi. Topp’s previous choreographic works include four pieces for Bodytorque, and music videos for artists including Megan Washington and Ben Folds. She received an Australian Dance Award nomination for her 2015 work Same Vein. Sure to inspire wonder at the sheer variety of modern ballet, Symphony in C is dance at its most powerful and poetic. STEP INSIDE the Ballet: The Australian Ballet’s much-loved Step Inside program gives a rare look behind the curtain at Arts Centre Melbourne. In this boys-only class, taught by one of our male dancers, learn moves and techniques, have the chance to ask questions afterwards and even watch company class. An unforgettable day of fun and dancing, just for the boys. Artistic Director David McAllister hosts an intimate talk with a luminary from the ballet world. Symphony in C audiences are invited to stay behind after the show for a special Q&A with Artistic Director David McAllister and a panel of artistic staff and dancers. Music Director and Chief Conductor Nicolette Fraillon gives a fascinating insight to the scores you’re about to hear in this free pre-performance talk. Learn about the composers’ lives, the historical context of the music and what it’s like to conduct and play.